As today is Veterans Day, I thought it may be of interest to touch on one of the Veterans in my family. My father, Krist K. Jake, saw action in World War II as an Army enlisted man, one of 16 million Americans who served. During his lifetime he didn’t care to talk much about his wartime years so his 4 children had scant understanding of his travels and experiences during the War. However, several years ago, upon the death of our mother, we kids discovered a cache of 685 handwritten letters between them, all exchanged while they were separated by the War during 1942-1945. These were recently reviewed and cataloged by my brother – they provide a personal, intimate, touching portrait of a relationship stressed by the distances and unknowns of wartime. 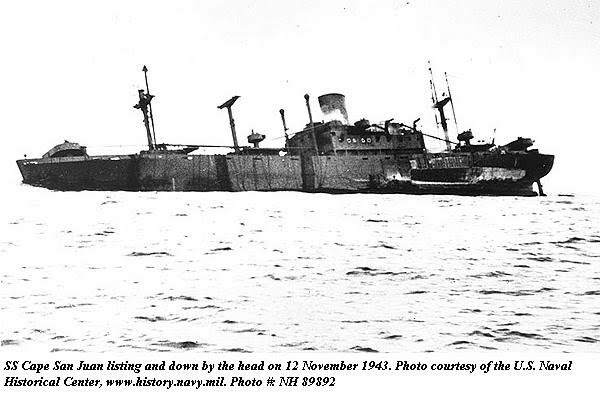 After the torpedoing, survivors were picked up over 30 hours by several friendly ships and a flying boat, then delivered to New Caledonia or Fiji, 300 miles to the northwest. For all of 1944 Dad was in the South Pacific on the War’s front lines. I was 20 months old when he was finally reunited with my mother in November, 1945; that’s when we met in person for the first time. Without doubt, there are millions of somewhat similar stories of those who fought in WWII. One can only imagine the War’s enormous costs of all types: financial, human, & emotional. Not pretty. I understand why my Dad didn’t volunteer much about his time in the War, but wish I’d have been aware enough to be more curious when I had the chance. In Washington, the World War II Memorial honors the service of sixteen million members of the Armed Forces of the United States of America, the support of countless millions on the home front, and the ultimate sacrifice of 405,399 Americans. It’s certainly worth a visit. This entry was posted in People of note. Bookmark the permalink.